I brought a head cold home as a souvenir, that and a ridiculously expensive nightie from the Betsey Johnson collection at Bloomingdale’s. But that was the one thing I had on my agenda: Buy ridiculously expensive underwear at Bloomingdale’s. Amy was a brilliant tour guide, feeding me at some of the best places I’ve ever been to eat. And for my belated birthday celebration, feted me at Fontainebleau Day Spa with a mani/pedi/mini-massage that left me drooling with delight (and I have a new favorite nail color: Essie’s Tomboy No More red. Gorgeous! ), and lunch at Ed’s Chowder House in the Empire Hotel, across the street from Lincoln Center. Would you believe I never made it to Lincoln Center in my previous NYC experience? And ever since reading Are You There God, It’s Me, Margaret when I was 8, I’ve wanted to stand on those steps. We also managed to get a few hours of adults-only conversation when Amy’s eldest took over babysitting duties for our wee bairn. It is the first time B and I have gotten to have drinks together in a public setting, with just another couple since Thor was born! We’re always going out one at a time, or only meeting up with groups of people in party settings–and that rarely enough–or one of us is the driver. We go out with other couples maybe once a year? Our last outing with another couple was with Karen and Jim, NYE 2009. Amy and I took advantage of the situation, and inundated B and Matt with stories of our checkered past employment. 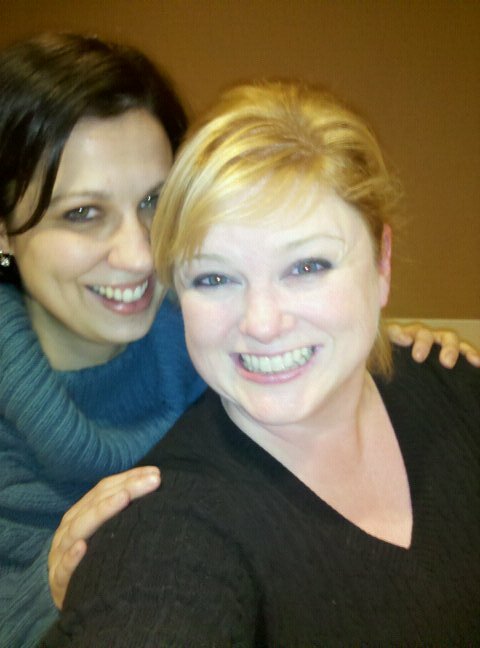 To top of my birthday fun, Amy and I went to Tiffany’s. We did not eat breakfast at the window. No, we went shopping. Sadly, they were slap out of what we wanted to buy (read that with a thick southern accent, will you?) We had this very, Tiffany’s is not Target, ladies, moment. Pfft. No, it isn’t. Pleather coin purses at Target are only $8, and come in colors that will match my bag. Undaunted, we just watched ladies giving salesgirls a hard time, and gentlemen schlepping around their spouses’ designer dogs while the spouses shopped for jewelry. 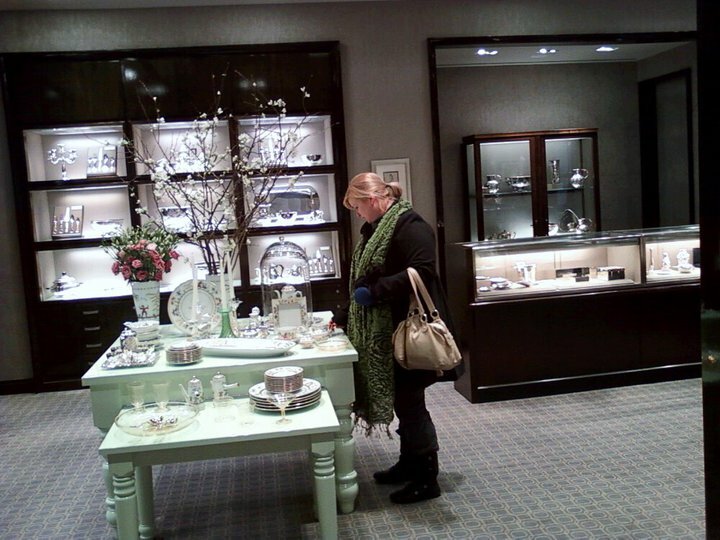 Amy snapped a shot of me trying to find a pricetag on a teacup. Honey, if you have to ask, you can’t afford it. No teacup for Lane. No teacup, and no pleather coin purse in Tiffany’s blue. Oh well. I’ll always have Bloomingdale’s! B and I had his party Saturday night, and it was so cold I didn’t even want to get dressed to go. I ended up in 2 pairs of thick tights, the FoH version of Mormon underpants (seen here in the SkyMall magazine, which made me laugh so hard, I disturbed Thor’s PSP playing), my dress (a black and white number) under a wool sweater. I didn’t wear my foxy green dress because it was just that cold. I chose wisely. Even indoors, I was just barely comfortable. 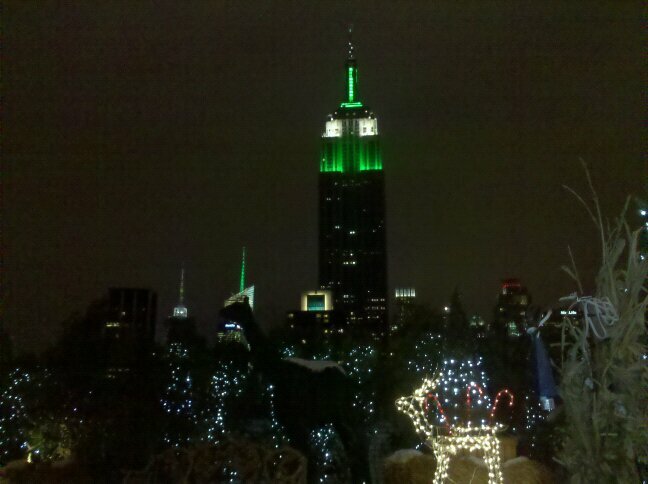 I was freezing my tuckus off when we went up to the heated rooftop portion of the party. 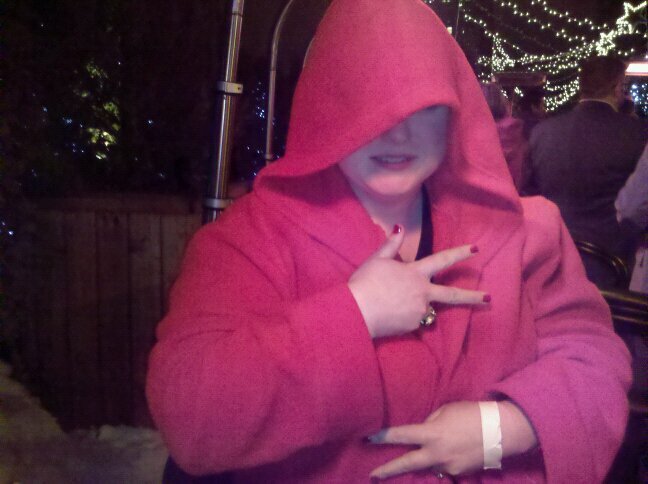 Fortunately, the club provided red, hooded Snuggies for all guests. We looked like a scene out of Eyes Wide Shut. I threw some gang signs and mine became a Thuggie. I love New York. I sleep like a baby there. And, since Amy is there, I love it even more.